Just a note to wish you, Readers, a healthy and happy 2010. Thanks for your interest—hopefully 2010 will give us more opportunities to trace the relationships we have with each other and our world. Best wishes all. See you in 2010. Looking for examples of globalization? What kind of shoes are you wearing? (T)he word “ugg” is short for ‘ugly’, and dates back to the 1920’s when shearers used to wrap sheepskin around their feet to keep warm in the sheds. In fact the humble ugg boot, now a popular fashion item, was traditionally considered dowdy. Dowdy, huh? Don't let the fashion industry hear you. (I like shoes. Okay, really, I love shoes. 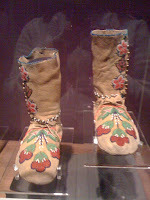 But even I have a hard time with these boots.) Anyway, history tells us that uggs were worn by pilots in WWI to keep their feet warm and by surfers in the 1960s for the same reason (after they got out of the water, of course). 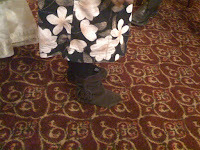 How could this type of footwear have traveled to Australia? It's not really such a stretch of the imagination to envision these comfy new shoes leaving the New World with hunters and traders in the 18th- and 19th-centuries. Australia is an environmentally diverse continent, with both deserts and rain forests, so it seems to make sense that this type of shoe would be an asset in this environment. 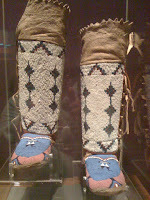 The Native Americans lined them with different furs to increase their warmth and substituted different materials for the soles to increase durability—these shoes were very versatile. Hmm. It seems that the basic appeal of moccasins survived the transition to ugg mass production—even if the beauty seemed to have been left behind. And it gives us a little bit of trade history along the way. As an anthropologist, my interest is people. Some may even say that my business is people. And truly, I want to talk to others (most of the time), and have them explain their world to me. I want to see things as they see them. Unfortunately, it's not quite as simple as walking up to someone and saying, "Hello, my name is Krystal. I'm an anthropologist. I see you're eating an orange. I don't like oranges. Why do you?" At least not all of the time. Interactions are dynamic. Any number of factors can color the situation—the social context, the person's mood, your clothing, etc. can all alter the interaction and the person's willingness to relate to you. Any number of things can put someone off. My earliest forays into fieldwork were frustrating until I accepted that while you can do everything in your power to make an encounter or interview go smoothly, it can still go wrong. There are just too many factors beyond your control. If your informant has a stomach ache, she may be shorter with you than she might otherwise be, causing you to think that she is unhappy or uncomfortable with you and the situation. Think about how this could color your relationship: She may in fact be embarrassed at how she is treating you, but unable to correct it, and you, the anthropologist, thinking you have offended her in some way, may leave her out of the ethnographic record for fear of imposing on her. Things can and will go wrong. I thought at this point in my life I had truly accepted this lesson, and then I started writing this blog and had an encounter that showed me that this is a lesson we can learn over and over again. My earliest forays into fieldwork had me working with a adult immigrants of West Indian descent I quickly learned to say I was a student collecting information or a researcher. I was never anything as fancy as an "anthropologist"—primarily because none of my would-be informants knew what that meant. They were convinced that I was in league with immigration officials and would have them deported. Interviews would be canceled when I called to confirm the appointment after informants had time to think about the meeting. I could feel the tension on their end just as they could likely feel my discomfort. Some would be hostile if I bumped into them on the street, keeping their responses to my greetings curt or avoiding me entirely. What could I possibly want to talk to any of them for? I was an American-educated girl who spoke with no trace of her native accent. I couldn't be there to help them, or even harmless for that matter. I survived the process though, and I did it by simply getting over it. I learned to see myself through the eyes of my "other" and how to break the ice gradually, how to restrain my energy and how to wait. Essentially, working with this group helped me build up a pretty extensive toolbox of disarming techniques that I have relied on time and time again to get different people to talk to me—until that it, I crossed paths with her. 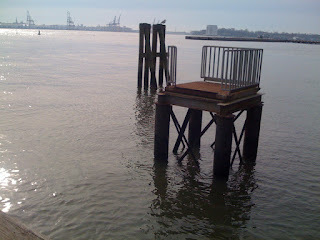 I use photos in my posts to help place my reader in the context of my words. You can't be there, unfortunately, readers, so I try and help you see what I have seen. Maybe you'll have a different analysis—which would be exciting! In any case, I'm careful in my photo-taking though I don't ask permission unless it's a sensitive issue. And I try and leave identifying characteristics, such as addresses, names, etc. out of the photo. If I'm caught in the act of photographing a subject, I always introduce myself and talk a little about the work I'm doing. (E.g., "You have a great bag! 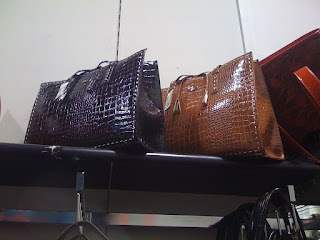 I'm looking at the different types of bags people are using to transport items for a piece I'm writing for my blog.") And for the most part, people open up. Some want to know more. Some just want to know what I'm doing. And some could care less once they know I'm harmless, and we part ways without causing too much stress to each other. A few weeks ago, I went to take some pictures of a street near my home at dusk for this blog. I walked about 20 feet from my driveway to a T-intersection and began to take some shots. I was standing in the street, probably 3 feet from the curb trying to get the last glimmers of sunlight through some impressive trees. Presently, a woman emerged from one of the houses midway up the block, and got into her car. She sat there, and I continued to take photos. She was not in my shot, and even if she was there was no way you could see her in her car from where I was positioned. Suddenly, the car's lights came on and the engine roared to life. The car sped to my location, causing my to beat a hasty retreat back to the sidewalk. The car and driver stopped suddenly at the spot where I had been standing. She looked at me. I waved. Though we don't know each other personally, this woman is my neighbor. She lives up the block from me—surely she has seen me before just as I have seen her. She didn't wave back. Instead she growled, "What are you doing?" Still friendly and upbeat, I said "Well, I'm a writer. I'm just trying to get some shots of the street for my blog." For whatever reason, I think she chose not to hear me. "Why don't you go take your pictures somewhere else?" "I'm taking a picture of this tree. It isn't anywhere near you or your home." "I wonder what the police would think if I called them and told them about your little photo shoot," she continued. At this point, I was a little shocked. This was my block, and as far as I was concerned I had a right to take photos there. I was not however going to point out my house to someone who was clearly being hostile. I was livid. I had done nothing wrong, but I held on to my composure and tried to channel everything I had learned from my initial attempts at fieldwork. Thinking that she thought she was the subject of the photographs, I tried an apology. "I'm sorry if I disturbed you," I said, trying to dispel her hostility. "I'm taking pictures of the street. You aren't in any of them." I tried my explanation again. "Apology not accepted!" she snapped and gunned her engine. I stepped off the curb back onto the street, now convinced that this was woman was not going to bully me. "It's not a crime," I said, "to take photos of my street." "Yeah, well we'll see what the police have to say!" "So call them! I've done nothing wrong. I'll wait right here." At that point she put the car in reverse and backed up to her house with a fair amount of speed. I refused to leave the scene. 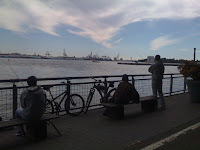 I continued to take photos even though the shot had long disappeared. When I finally returned to the house, I was furious. S suggested that I should have pointed out our house as it might have calmed her down. I felt that she had already decided not to hear me, so that it wouldn't have made a difference—and I don't think I wanted her knowing where I lived anyway. I don't know this woman personally. Perhaps I should have apologized and put the camera away. I think I expected more from her—as both a neighbor and as a resident of the community, which reveals something of my own bias, I know. In this instance, my tools failed me—reminding me that my toolbox is not concrete. But it also confirmed my ability to see myself in the eyes of my "other" because believe it or not, I can understand her: A perceived stranger standing on the street in pajamas near dusk is weird! I get it. We're all worried about anything out of the ordinary. The problem is that this anxiety clouds people ability to hear. If she had been anything but bent on being angry and telling me to get off of her street, she would have seen me what I was: a young woman who has walked by her home on many a summer night, in her pajamas, trying to take pictures of a row of trees. In her mind, she was probably doing her block a favor, but it still left me angry. I've played this scenario over in my mind a few times, trying to understand what caused her reaction: What was it in my manner that put her off? Was it the fact that I was in my pajamas? Was it the color of my skin? Was it my glasses? Does she have contempt for writers? Has she never heard of a blog? Why didn't she recognize me? 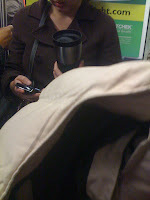 But I also have questions for myself: Why did I expect her not to care that I was taking photos? Why did I instinctively identify myself as a writer to her? Why did I expect her to recognize me? And why didn't I hold on to that lesson: things can and will go wrong when interacting with others? I wanted to share this story to show that ethnographic work isn't predefined.The social context colors all of our interactions and it's not something that can be easily read. She could have been having a bad day, perhaps her home had been recently broken into, or it could have been something darker that any of these explanations. I haven't seen her since in person though I have seen her driving by in her car from time to time. I was tempted to follow-up with her, but thought it best to let it go. I am interested in hearing your take on this encounter—as well as any of your own difficult encounters with your "others." What particular techniques do you have in your toolbox? Share below. The recession may have a positive twist after all. Yes, there are hundreds of thousands of people looking for work, and trying to hold onto their homes and feed their families—I don't discount any of that. But there may be benefits in the most unlikely of places. Reduced carbon footprint. Based on the deals being offered by the travel industry, it's safe to say that a lot of folks have passed on that vacation this year. A round-trip flight from New York to Orlando by airplane will net you about 0.31 tonnes of CO2. (I used the Carbon Footprint calculator to figure this out.) For those of you, like me, who don't have much of a sense of what that means, it's about 683 pounds of CO2. (I figured that out using a Google converter.) According to Carbon Fund, I could plant a single tree (cost: about $12.00), or donate approximately $4.00 to reforestation or renewable energy. I checked CarbonFund.org and the offers were about the same. For a single person it doesn't seem like much, but if you add up all the people who aren't flying, well, that could be a lot of CO2 that isn't being produced. Less reliance on fossil fuels. Okay, this one might be wishful thinking, but I've definitely noticed an increase in the number of LIRR commuters when gas prices rise. These folks tend to disappear when the prices fall again, even if the decrease is slight. So less gasoline consumption, means less demand, means less drilling and encroaching on wildlife habitats. Which sounds like good news for seals, polar bears, walruses, and penguins—somebody ought to send them an email. The recession may also mean less funding for environmental measures and research as money is funneled elsewhere to help families in need, but in acting to curb our own actions and consumer appetites, it might also give the natural world a breather. Do you think the recession could have a positive impact on the environment? To what degree? Have you noticed an increase in consumer conservation (e.g., reusable grocery bags, reusable coffee mugs) in your workplace/commute/neighborhood? Share your recession-related green stories below. Most Western children (and some adults) eagerly await the arrival of Santa Claus—easily recognizable from the description above. In his red suit and sleigh pulled by reindeer, he comes bearing gifts. If you've been good that is. Children are well aware of his rules too: he keeps a list, he checks it twice, and he knows who's been naughty or nice. If you've been nice (e.g., unselfish, polite, and helpful), you might find something neat waiting under the tree. If you haven't, well, you might get a lump of coal. The morphing of these three characters into Santa Claus packs a powerful punch—a gift giver, a moral watchman, and the embodiment of good cheer. While Santa has no helper to pack wayward children into sacks (CPS would NOT sanction such behavior! ), he is watching. He knows when you steal your coworker's lunch, or flip someone the finger for cutting you off on the road, or break something and pretend you didn't. Today Santa makes no distinction between good and "bad" children—all children get presents. 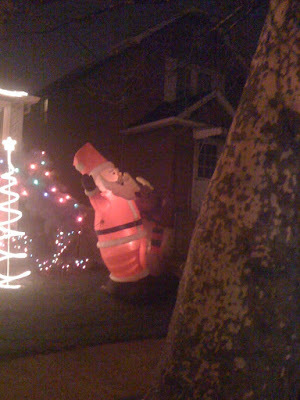 But the idea that Santa—or someone—is watching persists. In essence, he's watching because we all are watching in some ways. An early post on this blog explored Durkheim's idea that a moral sensibility governs the collective, keeping order to permit the continuation of society. The social order that governs our society is "watching," and symbols associated with Santa's may be manifestations of this moral sensibility by virtue of the power we assign them. Can you think of other symbols that are used to maintain social order? Answer below, and remember to leave some cookies out for Santa. He's on his way—you can track his progress using NORAD's Official Santa Tracker. 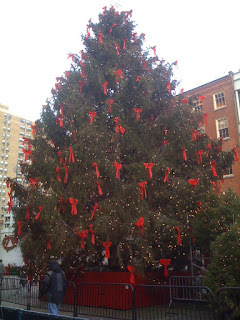 Does your town or city have an annual tree lighting ceremony? 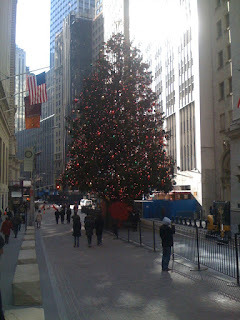 Trees have become an important aspect of the holiday season. This year, I've been largely successful at saving my Christmas tree from the destructive forces that are my cats. I don't really blame them for thinking that the large green thing is there for their climbing amusement, but I am almost always disappointed when I find that they made cat-sized holes in different parts of the tree. The tree is important to my commemoration of the holiday. 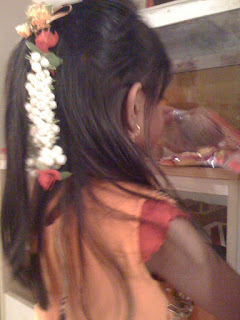 It provides the focal point in my home for the festivities, and reminds me of festive childhood celebrations. However, though many people might pass Christmas trees without giving them much notice, some certainly noticed the menorah standing at an entrance to the Fort Greene Park and questioned whether it was a violation of church and state since it stands on government land. The Chabad that sponsored the display actually obtained a permit from the park to do so, and park officials maintain that one Christmas tree and one Menorah are permitted to be displayed—if someone applies to sponsor it. The initial responses to the post have called for tolerance with religious symbols. It is acceptable to display physical representations of the holiday season? Share your thoughts on public symbols of the holidays below. Following my recent post on street performers, also known as buskers as I recently discovered, I've been noticing them everywhere. 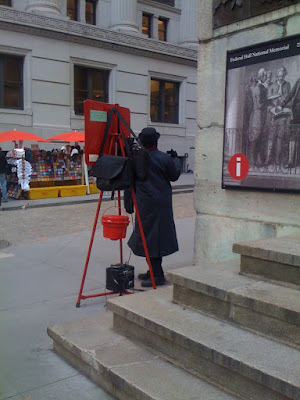 Their proliferation is probably due in part to the charity of the holiday season—I wonder what their tips have looked like this year. 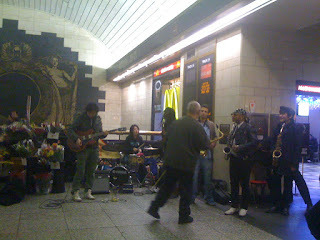 In any case, this group at Penn Station was really groovin'. 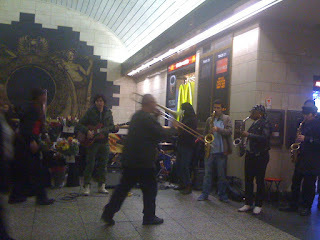 The brass players had a number of passersby tapping their feet and bobbing their heads. And one of the band members kept breaking into an impromptu dance. The diversity of the group was also noteworthy—the musical language crosses all divides it seems. I just had to stop for a second and capture them for you all. Hope you're picking up good vibes from this group via the network effect. 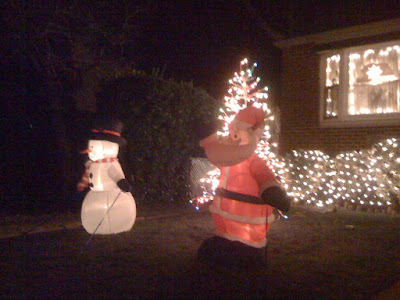 Updated to include link to NYT holiday light feature (see below). Much in the same way All Hallow's Eve and All Saints Day were promoted by the Catholic Church to replace Samhain, so too did Christmas become established in December as a means to replace Sol Invictus and Saturnalia. Christmas, literally Christ's Mass, has long been held by Catholics as the birthday of Jesus. However, there is some doubt today that Jesus was actually born on December 25th—or even in December for that matter. While Christmas is still a largely Christian holiday, there are certainly secular elements to it. Many cultures observe Christmas traditions—cards, gift exchanges, holiday decorations, etc.—without the religious overtones. The spread of Christmas practices has been aided by commercial promotions that push the traditions sans the religious elements. For example, there are non-religious holiday greeting cards, and festive and whimsical holiday wrapping paper and decorations that have little to do with the traditional Christmas symbols. While my Hindu neighbors don't have a Christmas tree, they have strung clear lights in their porch "to make their home festive, 'cause, it's the holidays." 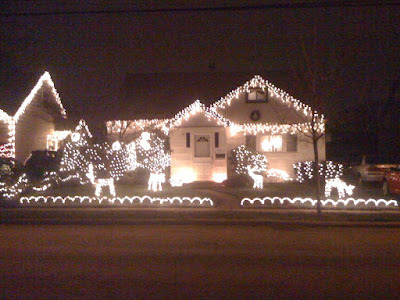 Image Above: Holiday lights adorn a neighbor's house. The element that seems to connect both the secular and non-secular participants of the Christmas season is lights, which brings us back to the roots of the season's festivals. Our connection to light seems to be universal—meaning, whatever our religious or cultural beliefs, light holds the same symbolic meanings for us all. This shared connection is apparent throughout history: the presence of temples dedicated to the sun, the orienting of temples to face the sun, and the worship of sun deities attest to the connection we have felt through the ages to light. 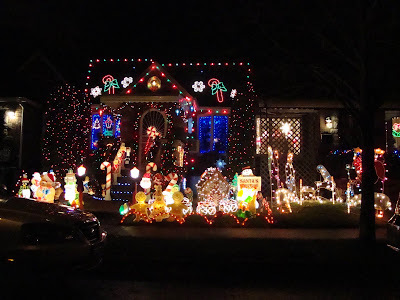 More than just a colorful holiday decoration, in their own way the stringing of holiday lights seems to echo humanity's earlier attempts to invoke the power of light. However you choose to drive the darkness away, know that you aren't alone. People have been looking for ways to celebrate light throughout the ages. Do you know of or practice a light festival? Share below. Also, the NYT has a feature on holiday lights as submitted by readers, which you can view here. Okay, we're not really talking about acorns today—we're talking about shellfish: scallops, oysters, and clams in particular. What do they have to do with daily life? Other than being tasty (if you're a fan of shellfish)? Everything! The saying "Great oaks from little acorns grow" means that great things can come from humble origins. Believe it or not, in some ways shellfish, which begin life at almost microscopic levels, provided the foundations for New York City. But there's good news: ongoing oyster restoration projects run by The River Project indicate that oysters are returning to the waterways after a 100-year hiatus. And recent scallop harvests on eastern Long Island provide addition support that shellfish may be making a comeback. The Nature Conservancy is also seeing a return on investment: Since 2002, the group has released thousands of baby scallops into Peconic Bay, and this year scientists have predicted a harvest of tens of thousands of pounds of scallops after nearly three decades of poor shellfish returns. Shellfish are integral to marine ecology. According to The River Project, oysters can filter up to 30 gallons of water per day, removing solids, enhancing clarity, and encouraging the growth of underwater grasses. That's no mean feat for these molluscs that are working in waters contaminated by agricultural runoff, in addition to at least 300 shipwrecks, a freight train, dead bodies, stripped cars, at least one dead giraffe (it escaped from the circus), and about 100 silver bars, plus myriad contaminants. (FYI: The original shellfish population in New York Harbor was capable of filtering all the water in the harbor within a matter of days, but that was also before the bottom of the riverbed became coated with a viscous oil-like substance.) Shellfish also provide an important habitat for young fish with their hard shells and the nooks that form as they create beds. So a resurgence in shellfish around New York City and Long Island is a welcome phenomenon. I've talked and talked about the connection we have with our landscapes—the ways in which we shape and are shaped by our interactions with our environment, and the legacy this can leave behind: an unintended history of sorts. I'm excited about the shellfish revival not because it's a reversal of history, but because it's a new chapter in our history. One that speaks of growing awareness and responsibility for the natural world. Shellfish fed the New Amsterdam colonists, and provided the basis for a rich trade with the rest of the world—perhaps in some ways establishing New York City as the "island at the center of the world" as Shorto names it, as people looked to it for its rich natural resources. This story is also a good example for the argument that the local should manage the resources in its care: the $2.3 million scallop restoration project in Peconic Bay was funded by Suffolk County. [Image Below: Eastern Oyster, credit NOAA]. I'd like to hear from you about conservation efforts in your neck of the woods. 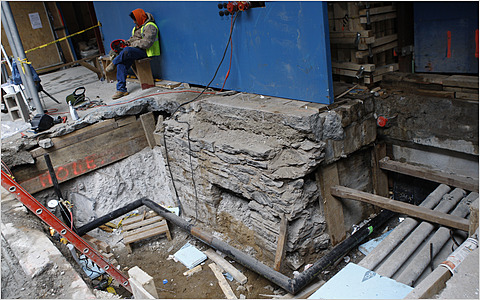 Chime in below if you know of any preservation projects currently underway near you. And if you live in the New York City/New Jersey or Hudson Valley area, The River Project is looking for oyster farmers—you can get details here. 2006 The Big Oyster. New York: Random House. Just as Malinowski's groundbreaking work on the Kula demonstrated how important gift exchanges were in the construction of meaning, Marcel Mauss has more recently argued that gifts are intrinsically viewed as part of a social exchange and receivers of gifts feel obligated to reciprocate. Lock's work highlights how this obligation becomes a problem with the unique human invention of organ transplants and is one that has generated conflicting attitudes about the exchange between societies. Martin Rundkvist has an interesting post up on the information that dendrochronology can provide. In New Dendro Dates and Provenances for Norwegian Ship Burials, Rundkvist discusses an article where two less-well-known ship burials are dated. Dendro-dating seems to have a great deal of potential for providing additional insights about wooden artifacts—it will be interesting to see how this dating technique can be applied. I also want to direct your attention to another post on Aardvarchaeology: In Mulled Wine and Waning Family Ties, Rundkvist blogs about the evolution of a family tradition that has faded as the parties involved have aged. His thoughts lead him to consider the ways in which the notion of "family" is constructed. This past year, my family has seen a number of changes with weddings and new babies. Roles have changed as parents have become in-laws, siblings appointed as aunts and uncles, and naming godparents has proved to be a political act. I have watched as these events have changed the relationships between a very close group of first cousins, and this post made me think about the future of this particular family—new alliances will undoubtedly be forged and new groups with their own traditions formed. As the holidays approach and we are inundated with "family" obligations and rituals and traditions, it's an interesting way to think about how these activities will change and what that will mean for our individual families. At Archosaur Musings, David Hone poses the question: Do We Over Specialise? Hone questions the ways specialisation limits knowledge even while increasing our ability to do "better and more detailed" science. He reminds us that while specialisation can greatly contribute to knowledge stores, scientists also need a sense of the bigger picture. The comments that have resulted have been interesting to follow—check it out and chime in. Technology has infiltrated many aspects of our lives. As a reminder that anthropology is moving into new fields, at An Anthropologist Goes Techno, there's a great post about the six tribes of Homo Digitalis. In the first digital anthropology report, tech users are divided into six groups. Where would you fit? And on this blog, I've had a few things on my mind. In Music and the Counterpoint of Humanity, I talk about the ways music can connect us to a heritage, a history, and each other. In Sleepers, Squeezers, Lurkers and More, I explore interactions on mass transit. 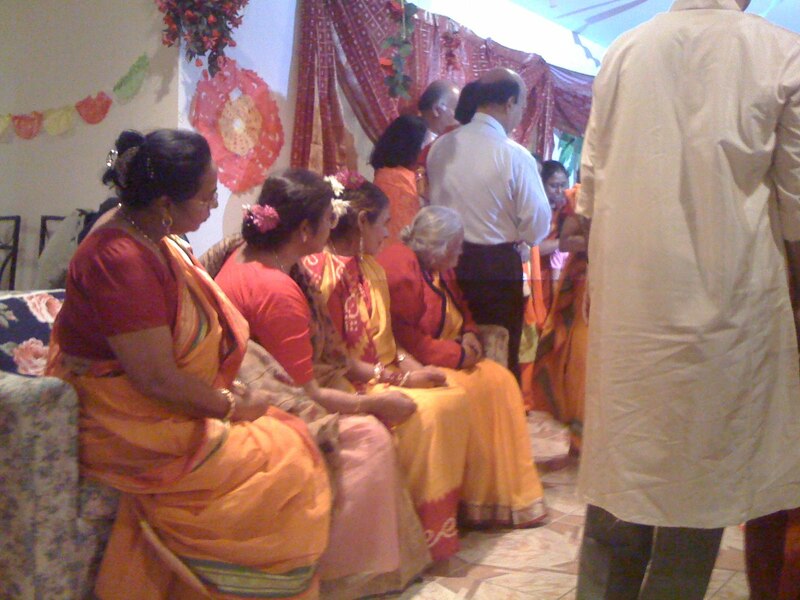 And finally, in the latest installment in the Culture in Action series, I take my readers to a Bengali Gaye Holud—a purification/beautification ceremony traditionally held for to-be wedded couples. In this instance, the tradition was adapted for a vow renewal ceremony. Well, that's it for now. There weren't too many submissions, so don't be shy about recommending posts that make you think about our relationship to our world and our histories. The next edition of Four Stone Hearth is scheduled for Dec. 30, and the hosting spot is still available so send Martin Rundkvist a note and keep the carnival going. In case you missed it, the last edition was hosted by Spider Monkey Tales. Be sure to check it out. One of my earliest posts introduced the practice of the gaye holud—a purification/beautification pre-wedding ceremony common in Bengali culture. Recently, I had the chance to revisit the practice and thought it might be interesting to discuss here. 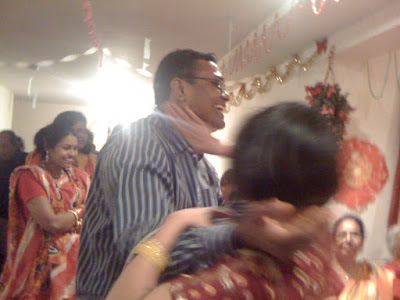 It took a slightly different form this time: The practice was included as a part of the 30th-wedding anniversary celebrations planned for an aunt and uncle within the family where it was transformed into a ritual for remembering and renewal. Though our "bride and groom" in this instance had been married for many years, on this night, they revisited some tender moments of their youth. 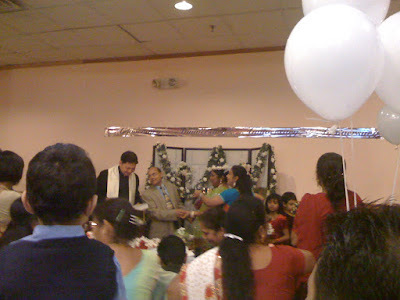 This gaye holud provided an interesting look at a traditional practice and underscores its importance in establishing family ties and acceptance. The bride's sisters-in-law put the finishing touches to the stage area. The family matriarch (right) supervised the process. 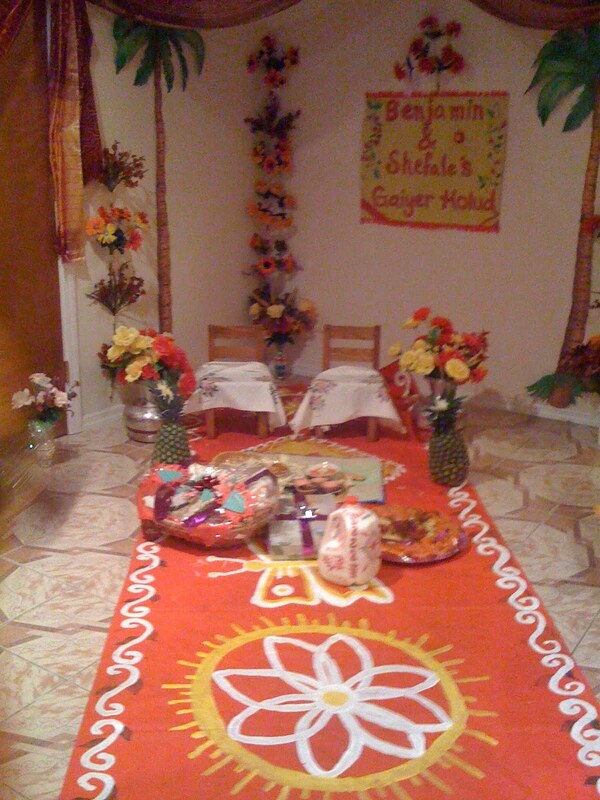 The completed dais for the event. The chairs displayed were for show only—normal-sized chairs were put out for the couple to sit in. 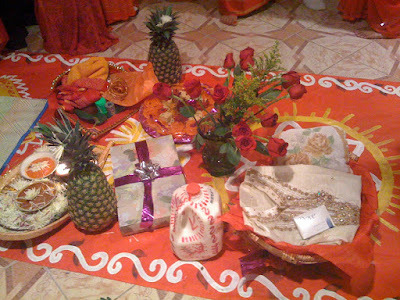 Offerings for the "new" couple, including milk (a symbol of both purity and nourishment), clothing for the bride (and in this case the groom) and assorted sweets and fruits. After the finishing touches were completed, the guests waited patiently for the couple to make their entrance. In the traditional form, a procession lines up in front of the bride's home, and the groom's family enters the home with much joyful noise-making. 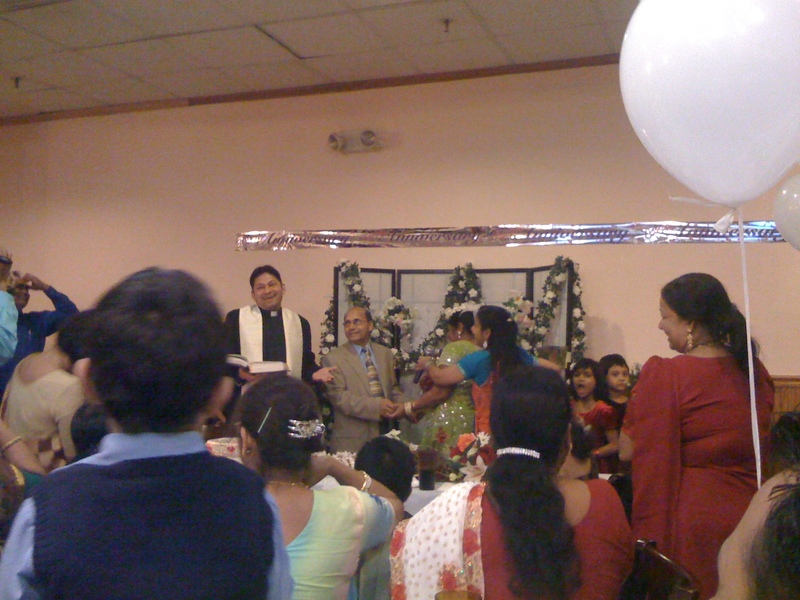 The family then waits for the official "presentation" of the bride—she is usually carried out to the dais. The same process is later followed by the bride's family at the groom's home. Since this ceremony was being done to mark an anniversary, there was no such procession. Instead, the "bride and groom" came to us. The bride's brother having some fun with the groom. The spectacle of him carrying his brother-in-law was met with hearty laughter as everyone rushed forward to try and get a photo. The happy couple—30 years into their marriage, reliving their time as newlyweds. 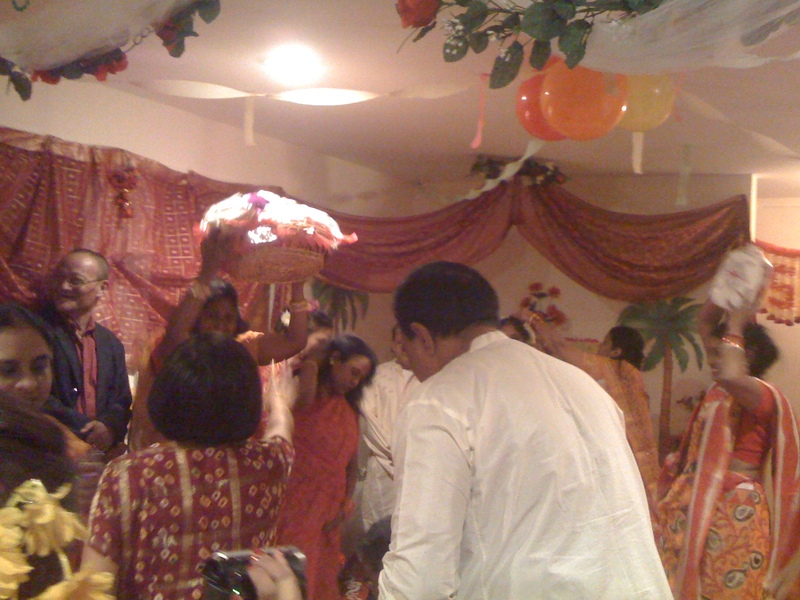 With the couple in place, the "offerings" were presented—with some impromptu dancing. 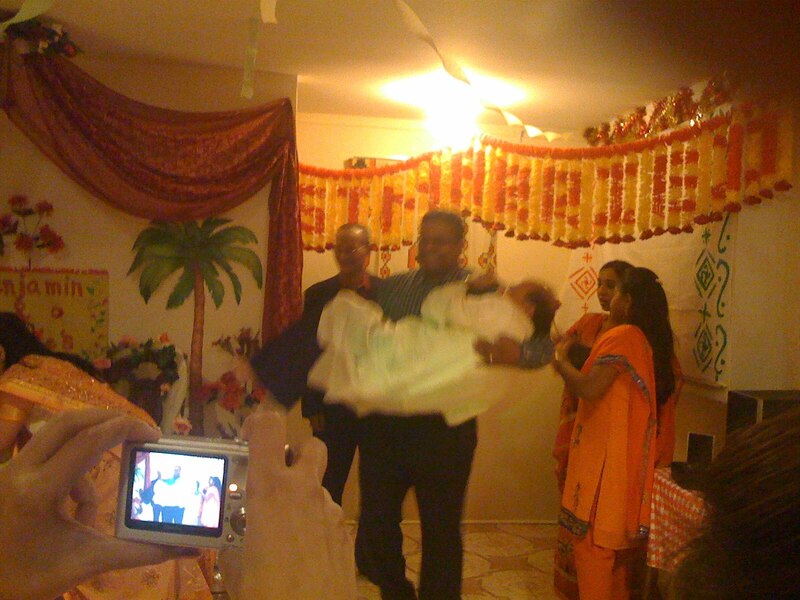 Everyone was in high spirits after watching the groom be spontaneously scooped up and carried to his place. Following the offerings, came the highlight of the gaye holud: the couple was covered with turmeric, which is believed to both beautify and purify the celebrants. It's yellow color probably also links it to this role. Turmeric does stain, so when the festivities took on a holi-type nature, Steve and I quickly looked for ways to escape the flying paste. The offerings that were laid out on the dais are presented to the couple. 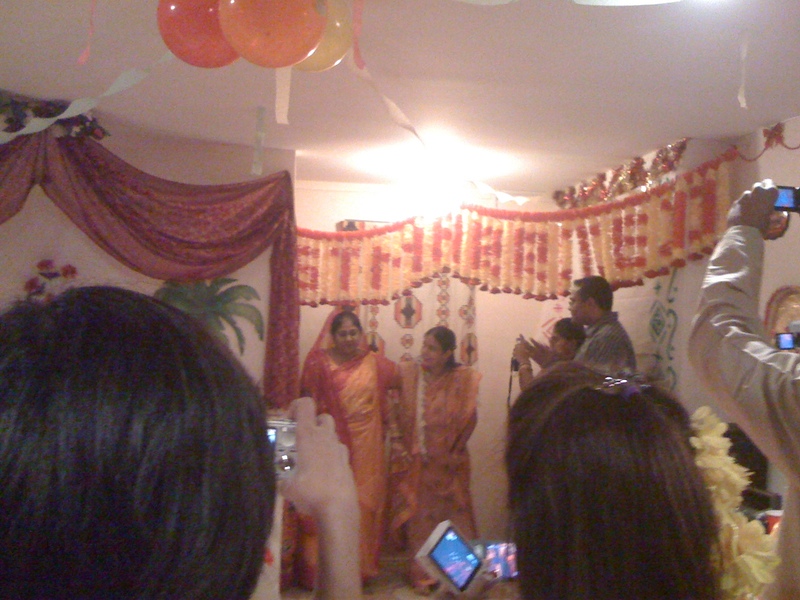 Left, the bride's sister hoists sweets in the air, while another sister carries a decorated gallon of milk on her head. 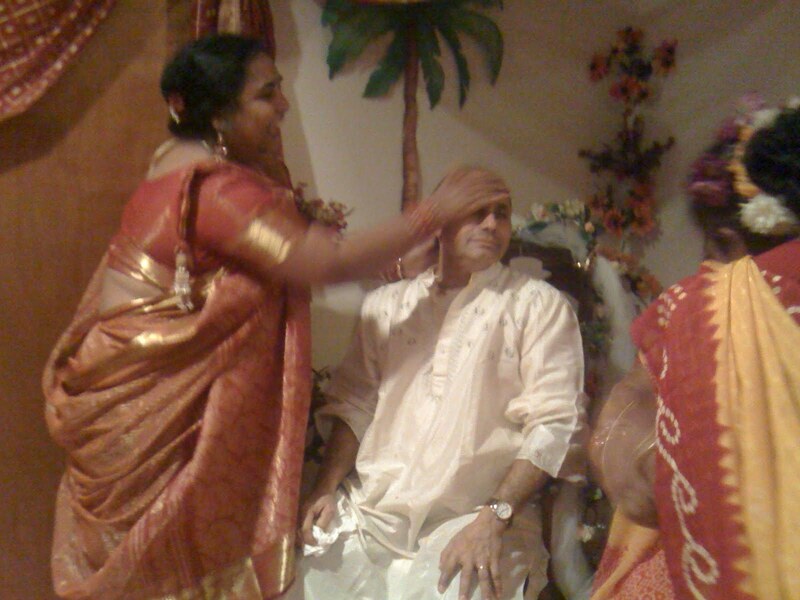 This celebrant is not exorcising the groom—she is liberally applying turmeric. 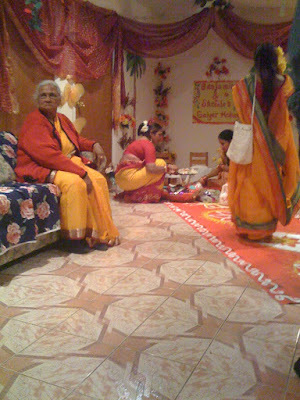 Celebrants, including the family matriarch, watch as turmeric is applied. Turmeric flies! The celebrants get a bit carried away as paste is flung freely. Following the holud events, what else would we do but eat? We had lots of appetizers to keep us happy while the couple got cleaned up and changed. And then it was time for dinner! 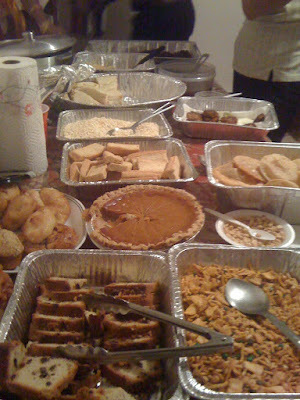 Appetizers, including, pie, fruit cake, puri, channa, and assorted sweets. Dinner is served. 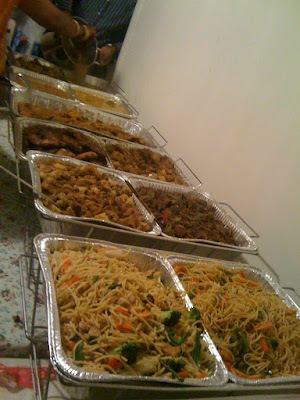 Interestingly, in addition to various curries, a West Indian-type chow mein was also served. I wonder if this "invasion" of a non-native dish is the result of the neighborhood where the family lives, which has a large West Indian presence. 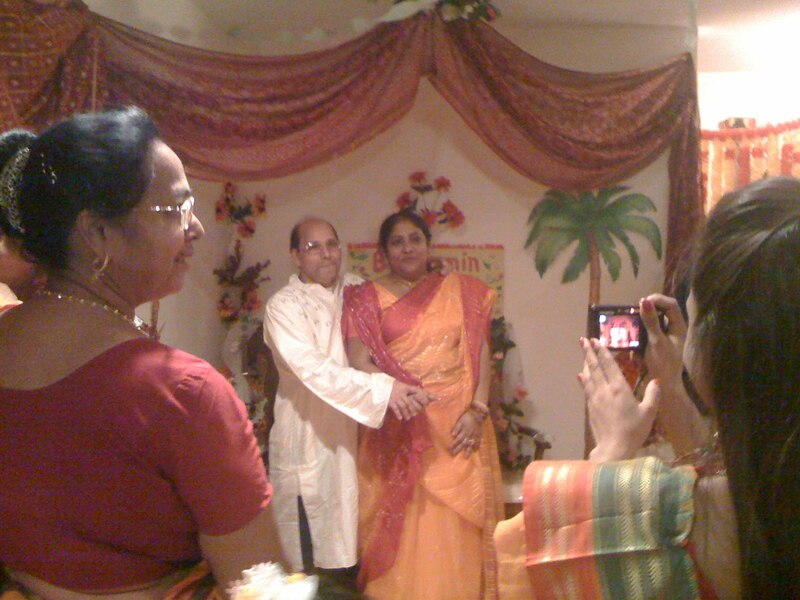 The gaye holud is a "night-before" pre-wedding activity. And in keeping with tradition, these events were a precursor to a vow renewal ceremony held at a restaurant the next day. It was moving and very sweet to note that the couple's voices still shook after all these years in reciting their vows (in Bengali) to one another and before friends and family. As is common to these events, food was abundant—on both occasions—rivaled only by the outpouring support from those gathered to honor the couple. 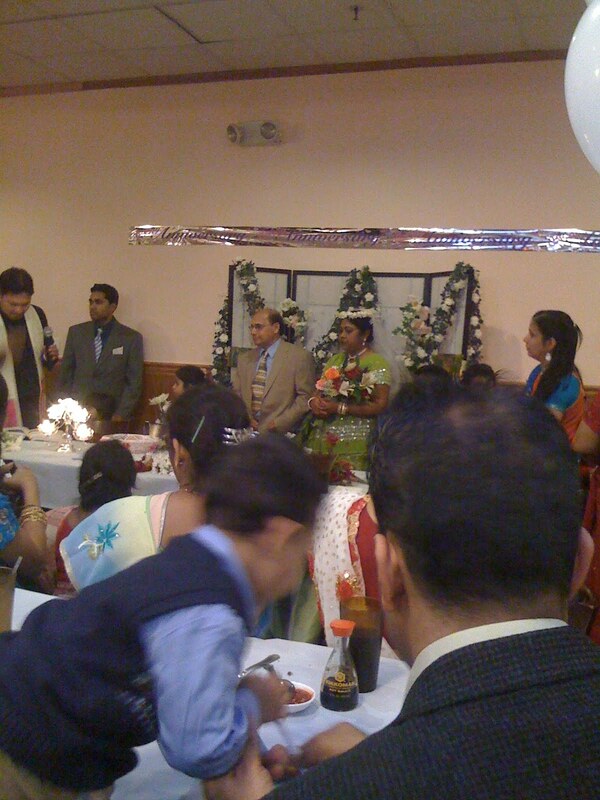 The couple arranged in front of a backdrop for the ceremony. 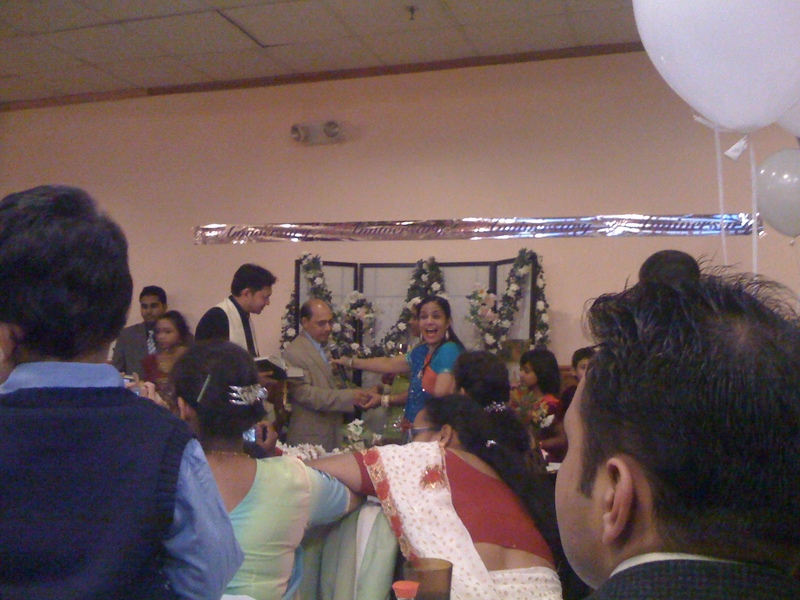 The Maid of Honor (bride's sister-in-law in blue) appears excited by the groom's recitation of his vows. The groom gets instructions from the priest. Even the priest seemed to be enjoying himself. More than just the motions of the ritual themselves, the practices seen here worked to bring this family together. The event would not have been possible without the support and willing participation of everyone involved. The traditional event marks the beginning of goodbyes for the bride's family and the introduction of the grooms family into the extended kin network. It also in some ways marks a transition of power/authority as the bride is accepted into her husband's family. (In an actual gaye holud, the bride is dressed by the groom's family in a sari and jewelry after the turmeric ceremony. She symbolically changes her clothes for clothing from her new family.) Because there was no new bride in this case, the event was a chance to reaffirm kinship connections. As the holiday season approaches its peak, many people will gather together with friends and family to mark the occasion. Do you have rituals of kinship? They don't have to be rooted in a traditional or cultural practice—it could be something like a family outing to the ice skating rink. Share your family stories below. For more information on traditional Bengali weddings (which are three or four day events), there's a good article here. Winter has finally arrived in the northeastern United States, so my thoughts have naturally begun to turn to summer. Believe me, after having the wind cut through clothing that you apparently layered in futility, you'd be wishing for warmer days too. During the summer months, my husband Steve and I tend to spend a lot of time near the water—living on an island, it's not really all that hard to do. He is an avid fisherman. * I prefer to lounge on the sand with a good book, but I watch. And take (mental) notes. And I've even brought in a fish or two myself (mainly flukes). This simple sport brings immense pleasure and satisfaction. It links us to one of our earliest means of sustenance, and reminds us that not all foods need to come from the supermarket in brightly colored wrappers—nature may still be able to support us if only we could learn to take only what we needed. A few weeks ago at the car wash, the car ahead of us drove in covered in mud and blood. The owner had been hunting in Maine and informed us he had "bagged" a 600-pound moose. While I stood there trying to picture the moose strapped to this guy's car rack, Steve struck up conversation about his own catches out in Montauk, home of the monster striped bass. Our new friend informed us that he and a few buddies were thinking of staging a rebellion by taking some fishing rods and throwing them in the water. That got my attention—my ears tend to perk up at the word rebellion. Steve nodded sympathetically, and pulled a fishing license out of his wallet, saying, "Yup. I hear you, but I've got my license to fish. Not taking any chances." I think the reason I had problems with licensing was because I was grappling with the following question: How would a fishing license change regulation? Well, the license would function like the driver's license. 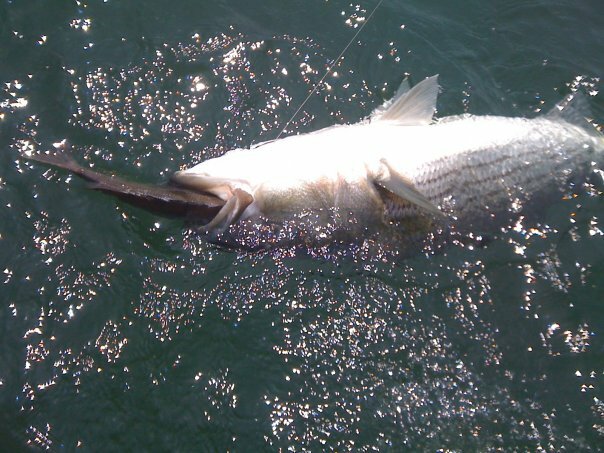 It wouldn't necessarily stop everyone from wrong-doing (like illegal u-turns, or keeping an undersized fish), but the harsher penalties that come with being caught as a licensed fisherman would hopefully deter a large number of illegal fishermen. But getting caught would still be a matter of chance. The license would not guarantee that everyone would do what they were supposed to do. And in this sense, it doesn't seem to be anything more than a way to generate revenue for the state. 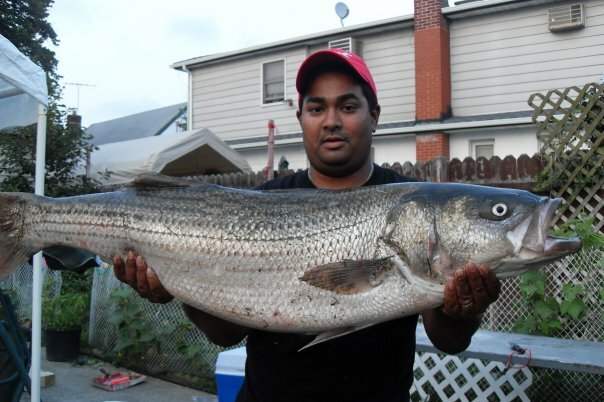 As you can imagine, the reaction from the fishing community on Long Island has been loud. A growing number of fishermen, led in part by Stuart Vorpahl, are mobilizing to reclaim the waters off of eastern Long Island for recreational fishing. Vorpahl is a commercial fisherman who has been fishing without a commercial license since 1984, when commercial licenses became mandatory. He has been arrested four times. However, Vorpahl has no intention of becoming licensed because he claims that the state has no right to regulate fishing in the region thanks to a 313-year-old colonial decree known as Dongan's Patent. And recreational fishermen are apparently protected under the patent as well. In 1686 Governor Thomas Dongan placed the responsibility for the management of the local land and waterways of eastern Long Island in the hands of locally elected trustees. Vorpahl and others maintain that the Patent still holds, and therefore the state has no right to issue and collect fees for licenses (which would go toward conservation efforts [see page 2]). 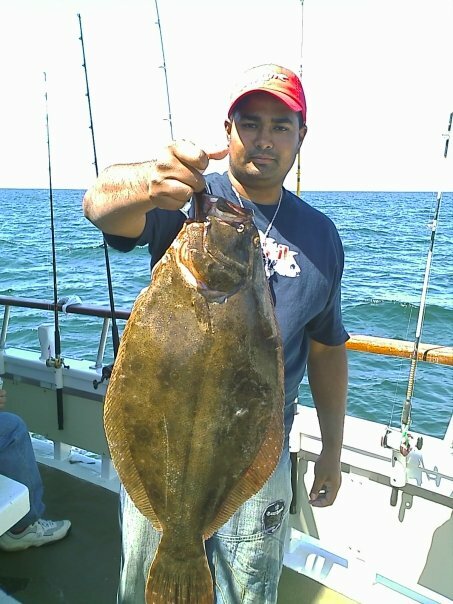 Six Long Island towns have since filed a suit against the state's DEC saying that the state has no authority to demand a license for fishing in the waters off their shores. Undoubtedly, concerns regarding summer tourism have their place in these lawsuits since eastern Long Island is known for its summer recreational activities. What's your take on Dongan's Patent? Does it still hold water? Is the DEC out of line for requiring licenses? Who should primarily be responsible for protecting our natural resources—the state, or the locality? Come on, cast your line below. 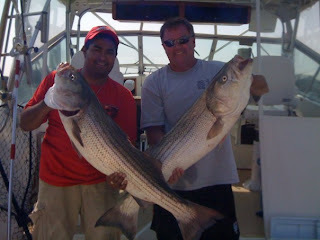 *Note: The terms "fisherman" and "fishermen" refer to all people who fish for recreation. We recently acquired an Xbox gaming console in my home, which has resulted in quite a few late nights and some bleary-eyed mornings. But sacrificing sleep may have a positive outcome: collaborative game play may actually result in stronger relationships and better teamwork offline. "Team objective-based games require a lot of communication between players to allow them to complete objectives, and playing such games can improve these skills and potentially help develop leadership styles." If one person is better at operating a vehicle than another, then he becomes the driver while the others wield weapons. If a propensity for a particular weapon is demonstrated, then efforts are made to claim that weapon for the player and support is provided as he uses it. In addition, resources are shared—weapons and leadership roles are rotated. On virtual teams where the players have an actual offline relationship, collaborative game play may act to cement their network connections forging stronger relationships that can be drawn upon in real world settings. In video games, you cannot advance until the level/match is complete. In a collaborative setting, this encourages teams to stick with a problem—they actually have no choice but to work through it. In the workplace, teams that are connected online may bring this same sense of problem-solving tenacity to the situation. They may also be less likely to discount unusual suggestions. The collaborative nature of some multiplayer games has been cited as proof that today's video games are actually social instruments—the image of the lonely geek playing video games on a personal computer is growing obsolete as people form networks and relationships in online gaming communities. Today's geek is likely to have international teammates that rival the connections of some businessmen. Teamwork guides have been developed, emphasizing respect for fellow gamers, good communication, and understanding expectations. The proliferation of these types of games with the Millennial generation and the growing popularity of social networking applications and media with these groups suggest that people are learning to work together in new ways. I'm not suggesting that managers mandate a online gaming night for their team members, but these types of exercises could be helpful in building solidarity and trust in work units.The workplace is definitely changing as more "digital natives" fill in cubicles, perhaps they'll also bring new strategies for collaboration as well. Has your workplace implemented technological strategies to encourage collaboration—i.e., a blog or custom designed video game? Talk back below (you don't need to share your employer's name).